A new of its kind study published in the journal Nature Communications reveals that inability to properly use the essential mineral manganese could be the probable reason for some cases of severe scoliosis in children. Researchers at Washington University School of Medicine in St. Louis have found that children with severe scoliosis are twice as likely as children without the disease to carry a gene variant that makes it hard for their cells to take in and use manganese. Manganese is required for growing bones and cartilage. Read Also: Should all children be routinely screened for Scoliosis? Genetic factors predictive of severe adolescent idiopathic scoliosis (AIS) are largely unknown. It is the most common pediatric musculoskeletal disorder, with ~0.3% of children having scoliosis with a spinal curvature of >20° (Cobb angle) requiring treatment, and more than 1 in 10,000 children developing severe spine deformity requiring surgery. 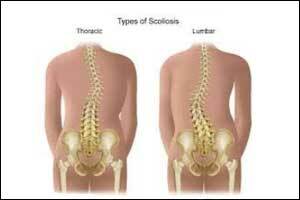 About 3 million new cases of scoliosis are diagnosed every year. Gurnett et al.conducted a study to identify the genes which contribute to the development of scoliosis. The investigators scanned all the genes in 457 children with severe scoliosis and 987 children without scoliosis. They found a variant in the gene SLC39A8 in only 6 percent of the healthy children but 12 percent of the children with severe scoliosis. The second analysis in a separate group of 1,095 healthy children and 841 children with moderate to severe scoliosis also found that children with scoliosis were about twice as likely to carry the variant. This gene hasn’t been studied much, but there are some reports that it helps cells take in minerals such as zinc, iron, and manganese. The researchers found that human cells with the gene variant successfully took up zinc and iron but failed to take in manganese. They also discovered that children with the gene variant had significantly lower levels of manganese in their blood than those with the more common form — although both groups were still within the normal range. “Our in situ results suggest that slc39a8 may have a role in spinal development directly as it is expressed in the developing zebrafish eye, brain, and spinal cord, but as it is also expressed in endodermal tissue more generally, the effect of gene disruption may be through its expression in the developing liver and its effect on systemic manganese levels, ”write the authors. Manganese is both an essential mineral and a toxin. High doses can cause manganism, a permanent neurological condition as well as psychiatric symptoms such as aggression and hallucinations. The mineral also has been linked to Parkinson’s disease, schizophrenia, and high blood pressure. On the other hand, too little manganese can cause manganese deficiency — although this is rarely seen in people because the human body needs only trace amounts that are easily obtained from food. But animal studies show that lack of manganese can result in problems metabolizing fat and sugar, impaired growth, difficulty walking and curvature of the spine.